First, the officers said wearing a helmet saves lives and is the law for kids in Massachusetts. Officers then knocked down a big myth, that wearing a helmet does not look cool. “Oh, it’s definitely cool,” officers assured the kids. “And please share the message with your friends.” As proof, Lieutenant Bina modeled his own helmet. Everyone agreed. He looked cool. Other tips? At red lights, cyclists must stop. But at crosswalks, officers suggested kids get off their bikes and walk across the street with pedestrians. Wearing bright colors to stand out is a must, while riding with friends is a good way to watch out for each other. And because bikes are too easily stolen, every cyclist should have a bike lock. The officers’ final tip: always replace helmets if they crack, if you take a fall or are involved in a bike accident. Helmets must be in good condition to protect you. Quincy Police Department bike officers answer questions from the 5th graders. After the Q&A session, Quincy police officers fit each 5th grader’s helmet. Lt. Bina modeled his bike helmet. 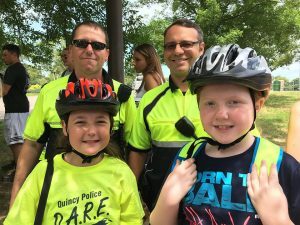 Quincy Police Department is hosting roughly 100 students at its two-week DARE camp. The camp is open to students across the city, but space is limited and it fills up quickly. The camp provides students a way to learn about the police department, with visits from officers from all areas of the department, and to have a fun summer experience with other kids and police officers. Breakstone, White & Gluck and our Project KidSafe campaign have partnered with the Quincy Police Department twice this year, donating a total of 200 helmets for city kids. In April, we donated 100 helmets for the Healthy Kids Day event at the South Shore YMCA and for officers on patrol to give to children who needed one. This week’s donation went to older kids heading to middle school this Fall. Since 2013, Breakstone, White & Gluck and our Project KidSafe campaign have donated over 10,000 bike helmets to protect children in Massachusetts. Our firm has represented cyclists who have been injured in bike accidents for over 25 years and we know that wearing a helmet can make all the difference for a cyclist. We are committed to protecting cyclists and preventing head injuries. Toward that goal, we have partnered with over 40 police departments, bicycle committees, community organizations and schools who are committed to keeping children safe. We are pleased to partner with Quincy Police. With over 100 years combined experience, the attorneys of Breakstone, White & Gluck fight for justice for those who have been injured by negligence and wrongdoing of others. If you have been injured, contact us for a free legal consultation at 800-379-1244 or 617-723-7676 or use our contact form.